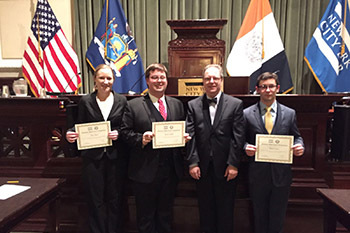 The College of Law‘s National Moot Court Competition Team competed in the national round this past week in New York City. The team finished in the top eight from a field of more than 200 teams, making it to the quarter-finals of the four-day concluding competition. The College of Law team also won third place for Best Brief in the national competition. Earlier, the team advanced to nationals from the regional competition in Boston, where the team won best brief, the best advocate trophy and the Lewis Powell Medal for Excellence in Advocacy. The College of Law National Moot Court Competition Team is: Kevin Braddock Smith 3L, Amy Doan 3L, David Katz 2L and associate member Brendan Hall 2L. The team faculty coach is Professor Richard Risman, who was joined by associate team coach Dominic D’Imperio L’09. The National Moot Court Competition is an annual intercollegiate event co-sponsored by New York City Bar Association’s National Moot Court Competition Committee and the American College of Trial Lawyers. Since 1950, they have promoted the appellate advocacy arts of intellectual rigor, legal research and persuasive argument.